When visitors approach the intersection in front of Seattle’s famous Pike Place Market in the heart of downtown, the surprise is palpable when they realize that a ‘go’ for pedestrians lets people walk any way they want. Los Angeles recently followed suit, introducing its own omnidirectional ‘scramble intersection’ at a notoriously dangerous crossroads, making it much safer. 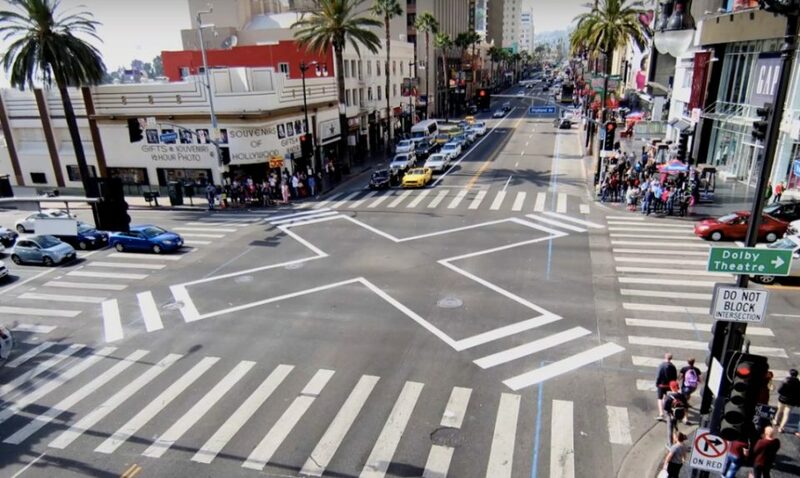 At Hollywood and Highland, designers have taken things a step further, adding an X-shaped layer of walking indicators (zebra stripes and white-framed boxes) to make it clear how people are permitted (and encouraged) to cross the streets diagonally through the center. Popularized in the 1950s by Henry Barnes, the concept is quite simple: when pedestrians get their green light, anyone can cross anywhere during the limited window, then the lanes are given back over to cars and the process repeats. In the months since this latest scrambler was introduced, there has been only a single accident. Scramble intersections can be found around the world, but are still limited in quantity, focused in areas where the safety gains are greatest. In dense cities like Tokyo, Japan, they can be marvelously busy at times (as shown above). In Seattle, meanwhile, the success of the Pike Street and First Avenue scrambler has led to others being introduced around the city; perhaps LA will continue to follow its lead.